Welcome to my Monthly Income Report for July 2016! It’s amazing to think that I’ve written nearly 100 of these income reports (this one will be number ninety-four) since SmartPassiveIncome.com started way back in October 2008. Initially, it was created to show the sales and success of my architecture exam business over at GreenExamAcademy.com. Fun fact: I had only intended to write an income report once. But so many people enjoyed the transparency in that post that I have kept it going ever since. Now, the income reports are, by far, some of the most popular posts on the site. Why? Well, of course, people like to check out how much money has been made, and we’ve come a long way since posting only numbers from GreenExamAcademy.com. Several other businesses, niche sites, and even income generated from this blog now account for my total income generated, as you can see in the income breakdown below. However, these posts are much more than just about the numbers. They are about the lessons involved and everything that has made those numbers happen, and also my plans for what’s coming next. I have a lot of exciting things to share with you about what happened last month, so let’s get right to it! The first big event in July was one of my favorite conferences, Podcast Movement, which took place in Chicago this year. Last year, I gave the opening keynote, which I was happy to still be getting comments and compliments about from attendees who were there last year! This year, I spoke at a smaller breakout session during the middle of the event, but I still made sure to give myself enough time to prepare a great presentation. The second half of June and the first part of July were dedicated strictly to rehearsal and fine-tuning my slides for the show. You see, I consider public speaking like taking part in a performance. Each time I get ready for a presentation, whether it’s a more mindset-based one like I did last year at PM15 about the topic of fear and self-resistance, or a more technical and action-based session like the one I did this year (titled How to Get Off the Plateau and Create a HIT Episode That Will Skyrocket Your Downloads), I make sure it becomes something people will remember, which for me means high quality information alongside high quality delivery. If you’re interested in hearing more about public speaking, one of my most popular episodes of SPI TV is actually about all the things I do to prepare for a presentation, which you can find here. After I arrived in Chicago a couple of days early, I felt compelled to explore the city a bit and really get to know Chicago better. I took a walk along the river right through downtown, and I even had a Chicago-style deep dish pizza at Giordano’s, which took fifty minutes to bake, but was absolutely worth the wait. All in all, an amazing event. My presentation went very well, and I was told it was one of the favorites of the entire event, which is always my ultimate goal! Thanks to everyone who was in the crowd, and especially to those of you who came up to me afterward to speak with me outside in the hallway—I was there for three hours straight, but they were three hours well spent! Thank you! The evening after I spoke, I had the pleasure of having a private dinner with John Lee Dumas, Jonathan Fields and his wife Stephanie, and Andrew Warner and his producer, Jeremy Weisz. 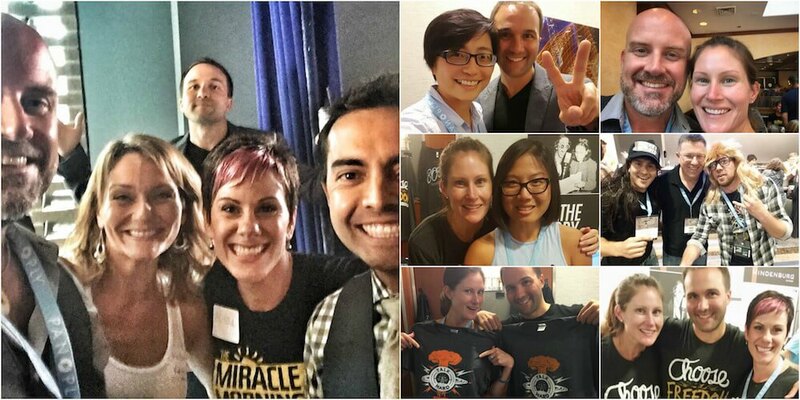 Most of you know John Lee Dumas already from Entrepreneur on Fire. He’s been on the SPI Podcast three times (77, 97 and 223)! John recently moved from San Diego (where I live) to Puerto Rico, so it was great to catch up and hang out again. Jonathan Fields is someone who I’ve always admired ever since I started building my online business. He’s the founder of Good Life Project, which is a show I highly recommend. But, even before that, I remember him from a TedX talk I saw in 2010 about “Turning Fear into Fuel.” It made a huge impact on me as I was growing my business, and I was excited to finally have a chance to sit down with him and have dinner. Typically, we just see each other and say hi as we pass each other in the hallways at events, so this was really special to me. You might know Andrew Warner from his podcast, Mixergy. I had the pleasure of being interviewed on his site years ago, which ended up becoming one of the most intense, but real interviews I’ve ever done. I loved it, but ever since I’ve also been very intimidated by him. Coming into this dinner, I wasn’t sure what to expect. He totally drilled me in the interview, and I wasn’t sure how he really felt about me. After some surface level conversation and sitting down at our table, Andrew immediately made some comments about me, but they were not what I was expecting. He had told me that he really enjoyed my presentation, and followed that up by asking me a number of questions related to my preparation and speaking style. He then asked everyone at the table what he could do better, since he had just spoken the same day. I was impressed with his openness! And after that moment, I knew Andrew and I were going to be good friends. He’s a super genuine guy, and I only wish I could hang out with him more. Truly, if you’re not listening to his show already, you should. Start with our interview together, and you can see why I call him one of the best interviewers out there. After Podcast Movement was over, I was back home, ready to enjoy more of the summer with my family, which became the primary focus of the rest of the month. I typically like to turn down the work dial and turn up the family dial during the summer months, and it started with a lot of water. Both of my kids started swimming lessons this summer. Actually, we tried lessons for my son (six years old) last year, but that didn’t work out so well. It was only once a week for thirty minutes in a group setting, and each time he did nothing but hold on tightly to the instructor and cry—every single time. He was scared. Whenever he was in deeper water where he couldn’t touch the ground, he would freak out. Even when my wife and I were both with him in the pool together, he just wasn’t having it, so I knew it would be a challenge for him this year, especially with a coach who was going to work with him every single weekday for a few weeks straight. Our daughter (three years old) was excited and actually started to progress quite quickly. She didn’t have the same fear as our son, and because of that we were more worried because she was just going anywhere and everywhere she could without fear. She can’t swim on her own yet, but she can do it with someone holding her belly or hands. She’s real close, and we’re so proud of her. Our son, well, it didn’t start off so well this time either. What was nice, however, was that the coach knew that success wouldn’t happen overnight, and she just started small, challenging him with simple achievable games that would increase his confidence little by little. For example, she would dump a whole load of toys on the first step into the pool, and he’d have to reach down to get them. Then she’d do the same with the second step. It was a little farther, but still achievable without putting his head under. Then the third step, which he wasn’t able to get until about the third day, but after that, it was a piece of cake. After the first week, he was already retrieving toys that were at the bottom of the fourth and final step, which was huge. We knew if he just kept going, he’d keep progressing. As he kept going, day after day, there were good days, and there were bad days. Sometimes he’d be comfortable sitting on the edge of the pool and falling into the coach’s hands, and other days he wouldn’t do it and begin to cry and make excuses. It’s hard to see as a parent someone you love not believe in themselves, especially when you know they can do it (and even more so if they’ve already done it once before), but my wife and I had to keep telling ourselves this was going to pay off in the end. We just had to stay positive. Every day after swim, we always told the kids what we thought they did very well. Then we asked them what they thought they needed to improve, and we made sure they were always excited about the next day. Oh no. Something happened. This can’t be good. I thought maybe she was spent and needed some backup or something to take the kids back home, or maybe he acted up. I had no idea. So, immediately after the webinar I drove to the pool, and to my surprise, I saw him in the water. But he wasn’t just in the water, he was swimming. Completely on his own. No joke, my mouth was open for what felt like a few minutes. I could not believe it. Who is this kid, I thought to myself. When I asked my wife and the coach what happened, they said they didn’t know. Something just clicked and he just started charging the water and all of that resistance and fear was gone. It was even encouraging our daughter to tackle some challenges she has had along the way too. It was amazing! I almost cried there on the pool deck. I’ve been telling him that for years now, and to see him reiterate it back to me, it felt like what I was teaching him was actually sinking in, and to see his smile on his face when he kept swimming after that—it was priceless. So proud of our boy! He had a MAJOR breakthrough during swim lessons this week, going from crying at the edge of the stairs and not wanting to swim anymore, to confident and brave, swimming in the deep end, jumping off the ledge and begging us to come back to the pool every hour of the day. Such a champ, and a great opportunity to teach him a lesson he’ll be facing all his life – that sometimes the thing you fear ends up becoming the thing you enjoy the most. I wish I could read him The War of Art by Steven Pressfield, but he’s not old enough for that language yet. Maybe I should ask him to do a children’s version! Like I said earlier, the summer season is very much dedicated to family time, and the thing we were all looking forward to the most was our mid-summer vacation to Hawaii. We decided to stay on the island of Oahu. I really wanted to make sure I was completely work free for this trip, so leading up to it, I worked really hard to get ahead on all of the content channels—the blog, podcasts, and SPI TV—so that I didn’t have to worry about that while on vacation. My assistant, Jessica (you can listen to how she helps me with my email in SPI Podcast Session #115), was also ready to take charge with the emails that were coming in while I was out so I could focus 100 percent of my time on family. This was going to be a test for me. On past vacations, typically after the kids go to bed, I spend time in the hotel room answering emails or cranking on some projects, just because I have the time, but I really wanted to stay away from that this time to give myself some breathing room and rest before going hard in August on some upcoming projects, which I’ll talk about near the end of this report. Beyond random Snapchat, Twitter, and Instagram updates here and there, I was totally able to lay off of work for six days straight, and guess what? Nothing broke! Not only that, I was able to generate over $15,000 in passive earnings through the various income streams I have (which you can see in the income report below). It was a great reminder about why I do what I do and why this kind of business is, in my opinion, the best. It’s not about building something that you can then walk away from forever and have it continue to generate an income for you. That’s not possible in my opinion. All businesses need time, care, and nurturing to grow and scale. But, with a passive income business online, you can take these mini-breaks for a while sometimes, and have your business continue to work for you, instead of the other way around. Now, I haven’t taken three to four months off at a time like what Tim Ferriss calls “Mini-Retirements” in The 4-Hour Work Week, but it’s awesome to know that I can have that flexibility to do something like take a week off in the summer to enjoy time with the family. It’s huge and it motivates me like crazy, and it’s why I teach what I teach here so that you can have that same freedom. One interesting thing happened while walking the streets of Waikiki with my family before dinner. I walked by a restaurant called P.F. Chang’s, an American-Chinese chain restaurant that’s in many major cities in the US. So what was so special about this particular one? Well, I know who did the design drawings for it . . .
Back in 2006, working in the restaurant division at an architectural firm in the San Francisco area, I was helping with a lot of the design drawings for a number of restaurant chains, including P.F. Chang’s. I remember specifically working on this set of drawings because it was a P.F. Chang’s that was designed to go inside an existing building, instead of a stand-alone structure like many of their other restaurants. The way it looks today is very much a result of the work I did back then before I was let go in 2008 and started my own business. It was really trippy to look at it. It brought back all of the memories I had of architecture, and why I really loved it so much, but also the fact that I wouldn’t have been in Hawaii with my family on a weekday in the middle of summer with no worries about my financial life and business if it weren’t for the fact that I was let go. It really brought my whole journey around full-circle for me, and made me appreciate all that I had earned over the past eight years since I was laid off. Walked by this P.F. Chang’s in Waikiki, and was reminded that I actually did the design drawings for the remodel of this exact restaurant at this exact location when I was still in architecture, back before I got laid off and started my own business. It looks the way it does largely in part to the work I did in a cubicle in 2006. And now that I’m my own boss, walking the streets of Waikiki with my family next to me on a summer vacation, I can’t help but smile thinking about how crazy this journey has been, and how thankful I am for all the things that happened since then. Truly blessed and thankful for this reminder today! After I got back from Hawaii, I was super motivated and ready to work, because there’s a lot of stuff coming up during these next few months: a new course, a new software product (you’ll hear about this next week), a total redesign of the Smart Podcast Player launching next month, speaking gigs at The Financial Blogger Conference, Thrive and Converted 2016, plus much more. I’m excited to bring all of these to light for you soon, but for now, let’s dive into the numbers and get into the monthly breakdown of income and expenses for July. It was great to take time off. That particular vacation to Hawaii was planned way ahead of time, which was nice because, leading up to it, I could get more work done to cover for it, but do that relatively stress free. I’ve found “bird’s eye view planning” like this to be extremely helpful and very valuable to me. My twelve-month wall calendar has become one of my best friends. It allows me to do some crucial planning both for business and my personal life, and get a snapshot of what’s coming next and what’s down the road. I love it! One more thing came to mind about the P.F. Chang’s building I walked by. I guarantee that if I were to ask every single person in the world who the designer was for that building, no one, with the exception of the project manager on that project, would know I had anything to do with it. On the other hand, I’m getting thank you notes and letters for the work that I do online every day, including from those who traffic my smaller niches sites that I own: greenexamacademy.com, securityguardtraininghq.com, and foodtruckr.com. And I know many of you are getting the same kind of response from the work you do online as well, and if not, I highly recommend that be your goal. Do something worth being thanked for, because in this online world, you actually have more of an opportunity to make a difference. Knowing this keeps the fire lit under me, and helps me push through the difficult, stressful, and overwhelming times, and I know it can do the same for you too.